As technology advances, high pixel SLR camera, high-definition video and high-resolution lenses been introduced. 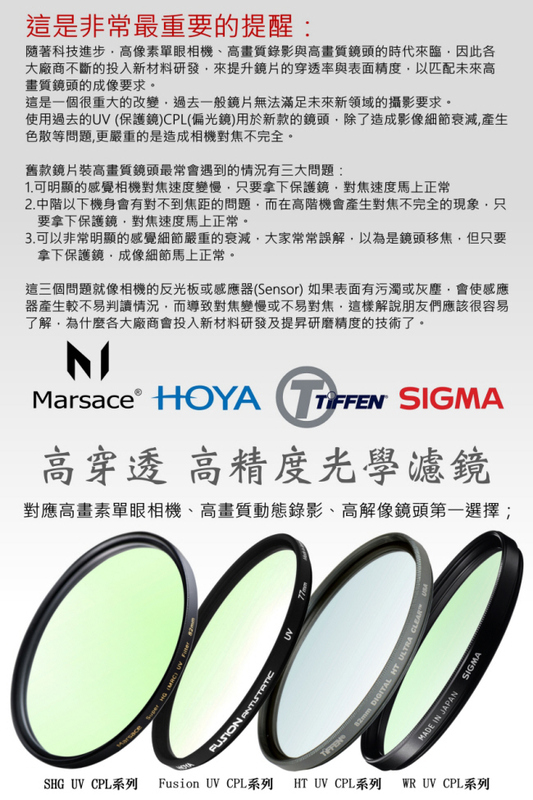 All well known filter producers continue to invest in new material to enhance transparency and surface accuracy of filter to match future high resolution lens requirements. This is an evolutional change due to traditional filter cannot meet future requirements of the new level of photography. 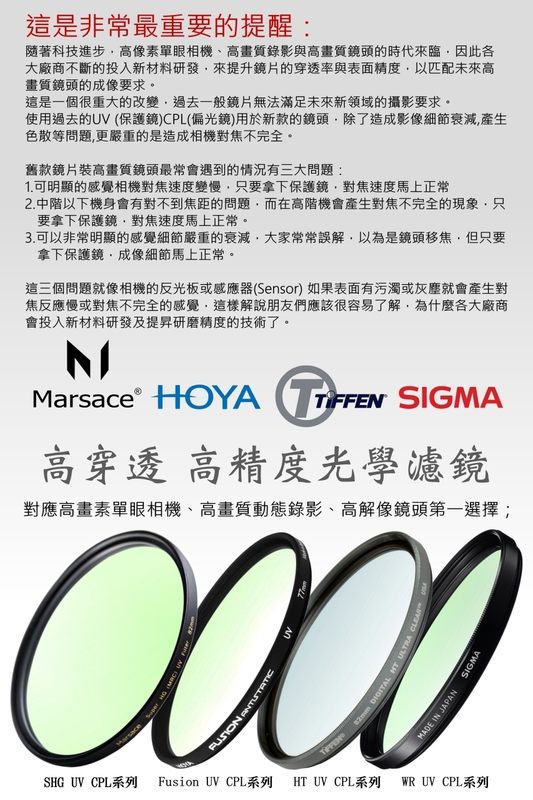 When traditional UV filter, CPL (circular polarizer filter) mount to an advance lens. 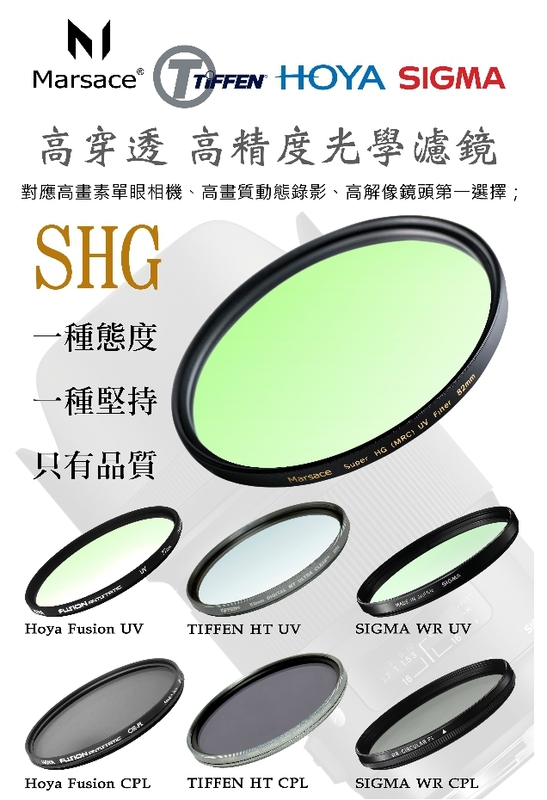 It will cause image attenuation, optical dispersion and other issues. Even worse it will cause fail focus. There are three common issues when a high resolution lens adapt with a traditional filter. 1. Focus speed will drop a lot. But it will back to normal when the traditional filter been removed. 2. Serious focus failure will happen on entry to middle range of cameras. Focusing inconsistence or error may be happened on a high end camera. Such issue can be solved by remove the traditional filter. 3. Image attenuated drop or loss detail can be seen. It usually recognized as lens shift. Indeed it can be solved by the traditional filter removed. These three issues just like dirt or dust stick on camera sensor that will cause the sensor reading error, and cause slow focus or difficult to focus. Therefore it should be understood easily that why all major manufacturers focus on and investing to new materials and precision grinding technology of filter.